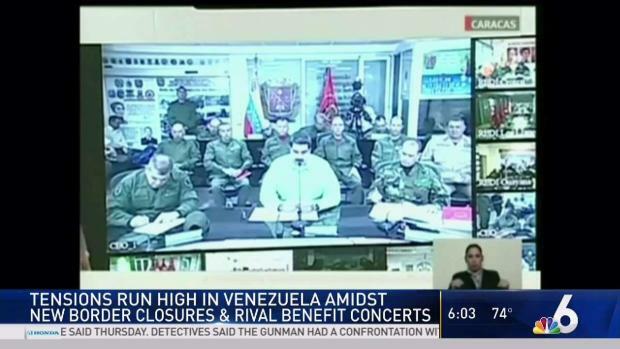 Throughout the turbulent day, as police and protesters squared off on two bridges connecting Venezuela to Colombia, opposition leader Juan Guaido made repeated calls for the military to join him in the fight against Maduro's "dictatorship." Colombian authorities said more than 60 soldiers answered his call, deserting their posts in often-gripping fashion, though most were lower in rank and didn't appear to dent the higher command's continued loyalty to Maduro's socialist government. 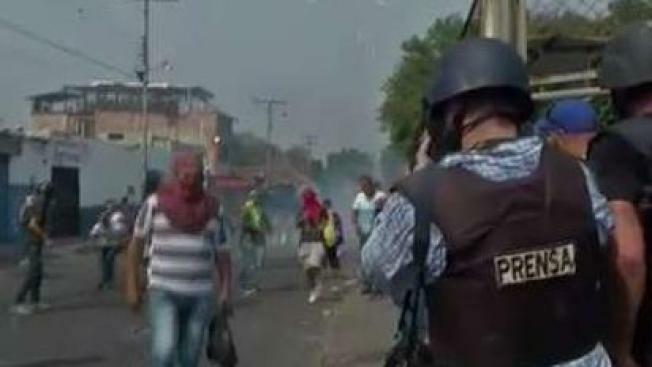 "They burned the aid and fired on their own people," said 39-year-old David Hernandez, who was hit in the forehead with a tear gas canister that left a bloody wound and growing welt. "That's the definition of dictatorship." Venezuelan security forces and protesters clashed as opposition leaders want nearly 200 tons of humanitarian aid to enter the country. 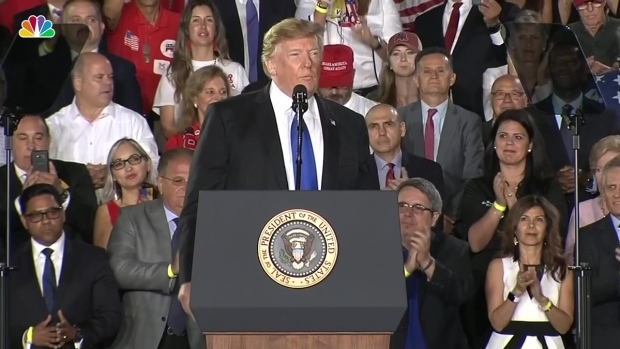 For weeks, U.S. President Donald Trump's administration and its regional allies have been amassing emergency food and medical supplies on three of Venezuela's borders with the aim of launching a "humanitarian avalanche." It comes exactly one month after Guaido, in a direct challenge to Maduro's rule, declared himself interim president at an outdoor rally. Even as the 35-year-old lawmaker has won the backing of more than 50 governments around the world, he's so far been unable to cause a major rift inside the military — Maduro's last-remaining plank of support in a country ravaged by hyperinflation and widespread shortages. As night fell, he refrained from asking supporters to continue risking their lives and make another attempt to break the government's barricades. Instead, he said he would meet U.S. Vice President Mike Pence on Monday in Colombia's capital at an emergency meeting of mostly conservative Latin American governments to discuss Venezuela's crisis. "How many of you national guardsmen have a sick mother? How many have kids in school without food," he said, standing alongside a warehouse in the Colombian city of Cucuta where 600 tons of mostly U.S.-supplied boxes of food and medicine have been stockpiled. "You don't owe any obedience to a sadist...who celebrates the denial of humanitarian aid the country needs." Venezuela's power struggle is set to become a battle of the bands Friday when musicians demanding President Nicolas Maduro allow in humanitarian aid and those supporting his refusal sing in rival concerts being held at both sides of a border bridge where tons of donated food and medicine are stored. Earlier, Maduro struck a defiant tone, breaking diplomatic relations with Colombia, accusing its "fascist" government of serving as a staging ground for a U.S.-led effort to oust him from power and possibly a military invasion. "My patience has run out," Maduro said, speaking at a massive rally of red-shirted supporters in Caracas and giving Colombian diplomats 24 hours to leave the country. 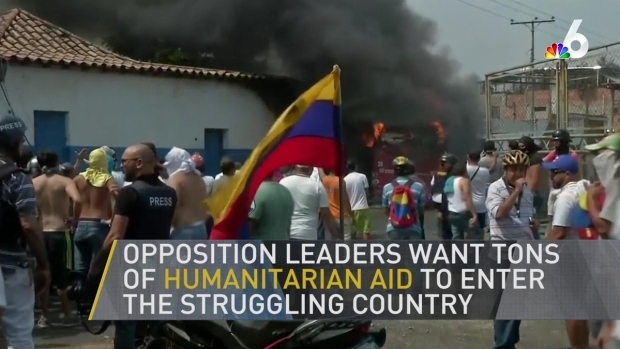 Clashes started Saturday well before Guaido straddled a semi-truck and waved to supporters in a ceremonial sendoff of the aid convoy from Cucuta. In the Venezuelan border town of Urena, residents began removing yellow metal barricades and barbed wire blocking the Santander bridge. Some were masked youth who threw rocks and later commandeered a city bus and set it afire. "They aren't deserters," Guaido said. "They've decided to put themselves on the side of the people and the constitution. ... The arrival of liberty and democracy to Venezuela can't be detained." The opposition planned to hold three simultaneous aid pushes on Saturday. 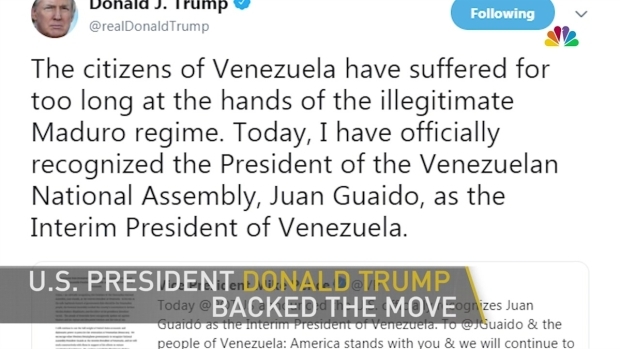 Aside from Colombia, they also had hoped to deliver humanitarian assistance by sea and through Venezuela's remote border with Brazil, which Maduro ordered closed. Dueling demonstrations also took place in the capital. Government opponents, waving American flags and one of them dressed like Captain America in a nod to the Trump administration's prominent role cornering Maduro, headed toward an air base. With the opposition mostly mobilized along the border, a much larger mass of red-shirted government supporters, some of them on motorcycles, filled streets downtown. Venezuela's military has served as the traditional arbiter of political disputes in the South American country, and in recent weeks, top leaders have pledged their unwavering loyalty to Maduro. But that hasn't discouraged young protesters like Juan David Candiales. The 17-year-old said he sneaked out of his family's home in Venezuela last week to help bring in the aid. Despite being shot four times in the leg with metal pellets, he raced back to the burned aid trucks late Saturday to square off with National Guardsmen one more time. "I have to keep going back — because this is the country where I was born and it pains me," he said. "If we can be here all night we will be here all night. I'm not going home until humanitarian aid is let into Venezuela."